Located at the National Memorial for the Unborn. 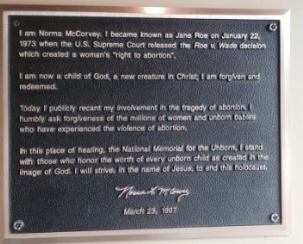 I am Norma McCorvey. I became known as Jane Roe on January 22, 1973, when the U.S. Supreme Court released the Roe V. Wade decision which created a woman's "right to abortion." I am now a Child of God, a new creature in Christ. I am forgiven and redeemed. 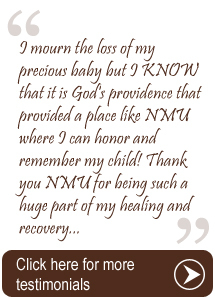 Today, I publicly recant my involvement in the tragedy of abortion. 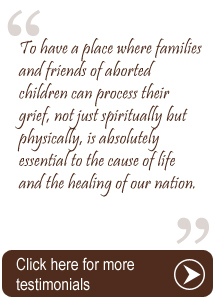 I humbly ask forgiveness of the millions of women and unborn babies who have experienced the violence of abortion. 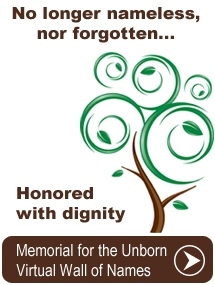 In this place of healing, the National Memorial for the Unborn, I stand with those who honor the worth of every unborn child as created in the image of God. I will strive in the name of Jesus, to end this holocaust. I am Sandra Cano. 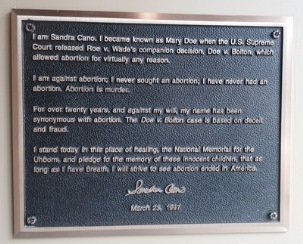 I became known as Mary Doe when the U.S. Supreme Court released Roe V. Wade's companion decision, Doe V. Bolton, which allowed abortion for virtually any reason. I am against abortion; I never sought an abortion; I have never had an abortion. Abortion is murder. 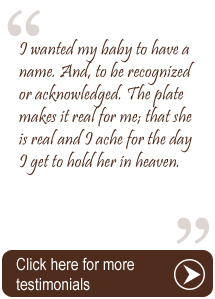 For over twenty years, and against my will, my name has been synonymous with abortion. The Doe V. Bolton case is based on deceit and fraud.